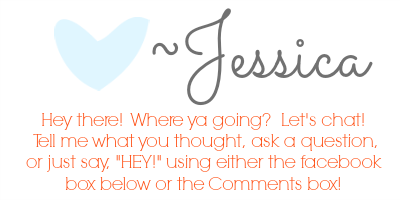 I know you are probably thinking…Geez, Jess! 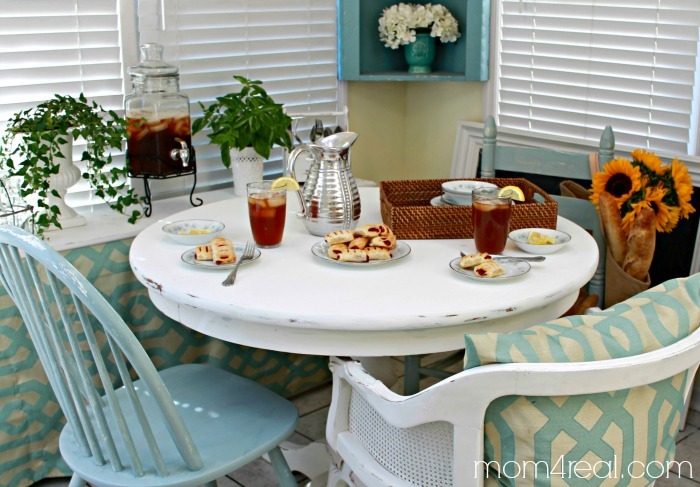 How many times are you going to change your breakfast nook? My answer, probably a gazillion more times. Honestly, it’s my favorite space in the house to play with. Not too long ago, I turned it into a homework station for Kate, and oh my goodness, it was so cute, but then I didn’t like hanging out in there any more…it was just too kiddish for me. Kiddish is a word, right? So, I found Kate a desk at a yardsale and moved her things upstairs to her room. Then I found this little chair at a thrift store, and BAM! 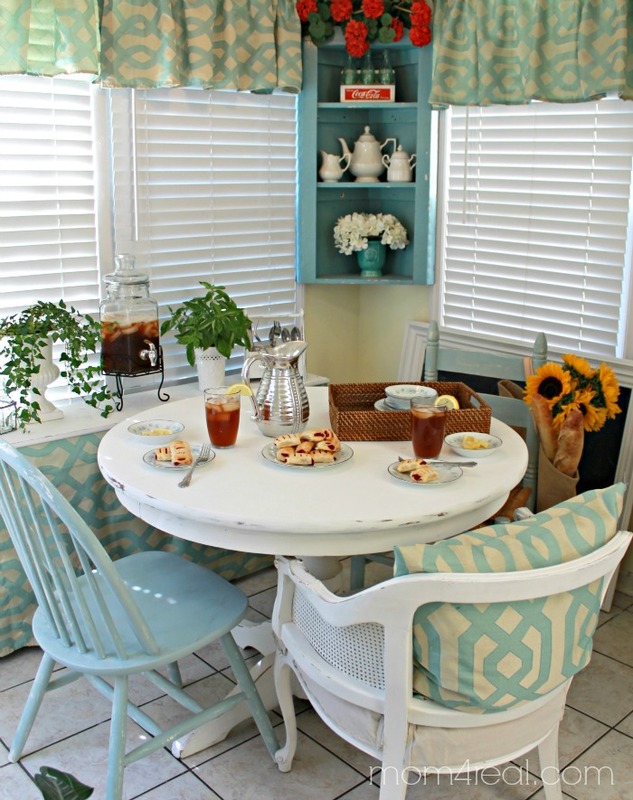 A breakfast nook makeover was imminent. Isn’t she pretty? This is her after the makeover…all aqua and perfectly distressed…my new favorite place to sit. In fact, I am sitting here right now typing this post! This is the before. All dirty and icky, but I could see the beauty in her lines and curves, and she was on sale for $20. I mean, curves are a good thing, correct? I knew she would be perfect with just a little love! And she wasn’t the only one that got a little makeover. My white pedestal table that I scored for $20 at a yardsale last summer got a fresh coat of paint as well. I didn’t want her to feel left out. Now I have a pretty place to perch during the day. I dressed her all up for a visit with a friend, and so that I could show you that you don’t have to break the bank to make a room pretty. Want me to break the cost of everything in the room down for you? White chair with caning missing from back – Gift from a friend. Other chair – $3 yard sale find. White Pedestal Table – $20 yard sale find. Aqua corner cabinet – $20 thrift store find. White shelf with curtain – shopped my home, so free. 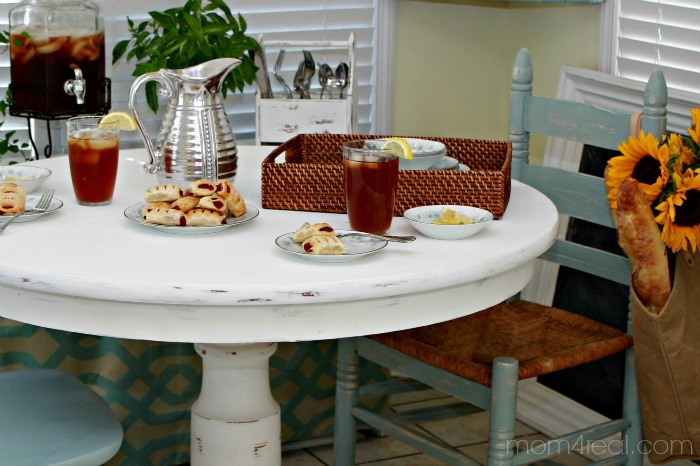 Paint for table and chairs – DecoArt Chalky Paint from The Home Depot in Serene and Everlasting $15.98 per 16 oz. container – used very little paint, so will have plenty to use on other projects! Understand though, you don’t necessarily have to buy things…shop your home! Find things here and there that you may not be using and then only buy the things you need to fill in the space. As far as the paint goes, you can totally use latex paint. I like the chalky paint because there is no priming or sanding necessary, and the paint sticks to the furniture well and dries extremely smooth! So beautiful, Jessica! 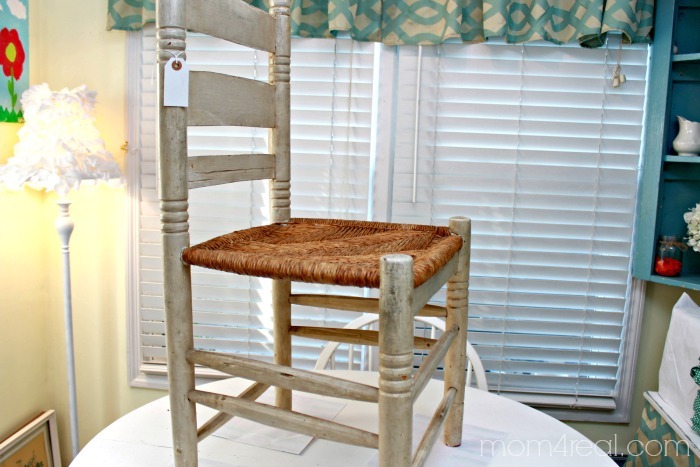 I love the color scheme and the chair makeover is stunning! What a fun little nook! Thanks so much for sharing! I love this!!! It is gorgeous, open bright and beautiful!!! Do you use the shelf with curtain for storage? So many fun pops of color!! Love the new chair…and the others, too! It looks so cozy and pretty! I love this and hope you don’t mind if I kind of copy your idea. I have an oak table also that I’d love to paint. What steps do you take to paint furniture, I never done this before. 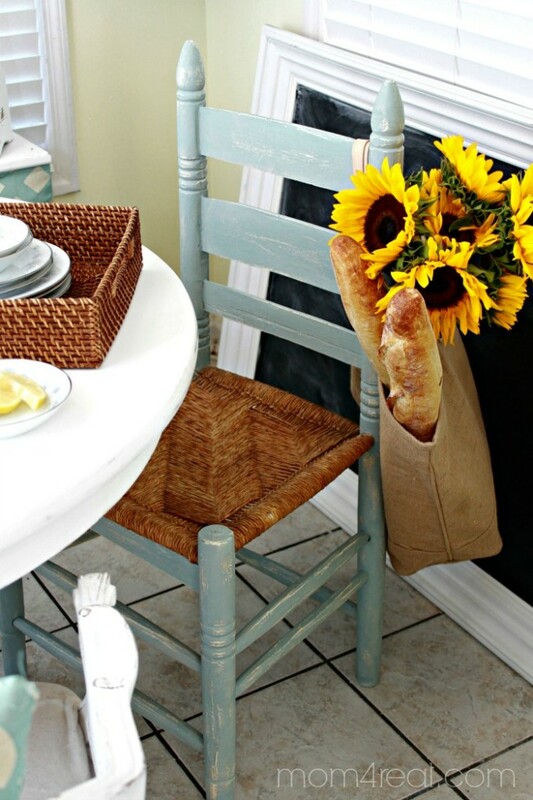 Love the chairs so much, but those baguettes made me drool, lol. Hi there. 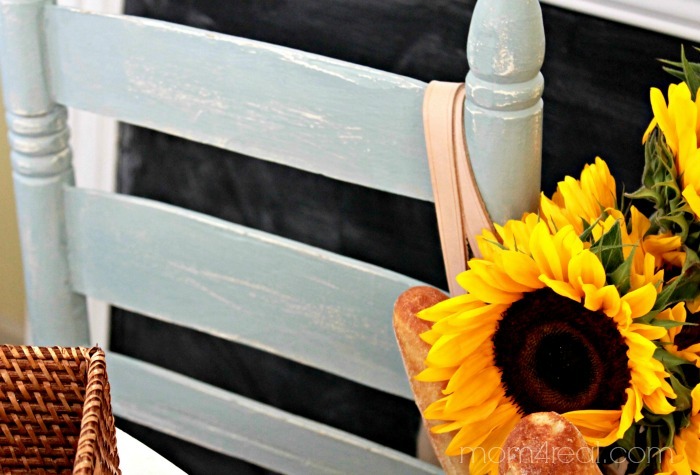 I just painted a long bench in my kitchen with chalk paint. Do I need to apply creme wax to seal it or can it be used as is? I don’t think I want a shine to it (right now anyway). I’m afraid if I use the wax to seal and don’t buff it, people sliding in and out of the sitting area will buff with their bottoms! Thnaks for any help.